The ride up to Val Thorens is one of those drives during which you can’t put down your camera. As you get higher, the views get more breathtaking, and the last photo you took more pointless. Every break in the slowly disappearing trees is an opportunity for Instagram fame, and before you know it, your camera is full. Once you finally reach the highest village in the French Alps and you’re officially woozy from the elevation, Club Med’s trident symbol marks your arrival. Directly facing you as you walk in the door is a white fluffy rocking horse in front of purple light installation resembling a Twilight Zone vortex. Decorative details like these—along with the long hanging multicolored fluorescent light bulbs and the pink walls and chairs—keep the psychedelic days alive in the French Alps. All that’s missing is a disco ball. To your left is the reception desk, and to your right is the focal point of the lobby; a wrought-iron staircase that winds up four flights. As if that weren’t enough to impress, just beyond that staircase is a fully-functioning rock climbing wall that also stretches four floors. Balanced by sleek leather furniture and an electric fireplace, the lobby perfectly demonstrates the resort’s multifaceted personality and client base. Whether you like it or not, you’ll be bathed in pink during your stay at this Club Med. And, since they’ve implemented the color so creatively, there’s a good chance you’ll come to love the girly hue if you don’t already. The inside of the closet is pink, as is the window between the bedroom and bathroom. Don’t worry, the rest of the room is covered in neutral tones like gray, white and sand, aside from the pink throw pillows. Other than the pops of color, the room is pretty simple. What’s most striking is the view from the balcony or floor to ceiling window, because 80 percent of the resort’s rooms have mountain views. Be sure to keep the curtains closed when getting dressed, though, because the ski lift runs right over the resort. Most importantly, the mattress is a dream, perfect for a post-ski snooze. The larger rooms also boast fireplaces and bigger balconies. The décor remains the same, however as the rooms get more deluxe, lodge-like details—like wood beams in the ceiling—come into play, turning the room into a 1970s den with a rustic edge. The one-year-old resort’s style was crowd-sourced. When decorating the property, Club Med asked their 1.2 million Facebook fans to help them deck the halls. Those fans chose things like the rock climbing wall and common area furniture. This is only one of the reasons I could not get enough of that lobby. The hotel has plenty to do—you can ski or snowboard right out of their ski room, dine at one of three restaurants, sample French wine in the wine cellar, catch a show in the theater, or enjoy the outdoor hot tub. With all this going on, you’d assume the lobby would be pretty basic, highlighting everything else the hotel has to offer. But, no. Club Med didn’t rest, they kept going and built a lobby that also acts as an activity center. Between the rock climbing, the Twilight Zone-lights, and the CARITA spa and hammam, there’s so much to do upon entering you might forget that you came for the slopes. 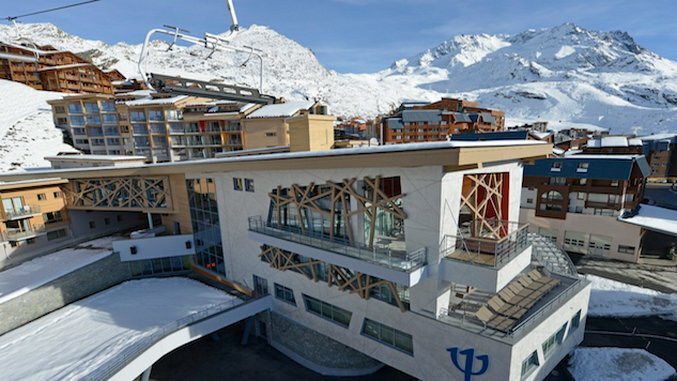 Val Thorens is one of the smaller villages in the French Alps. Even so, Michelin star restaurants and indoor entertainment abound. Then, of course, there are the 600 km of terrain to carve through right from the ski-in ski-out resort. Maggie Parker is Paste Magazine’s assistant travel editor.